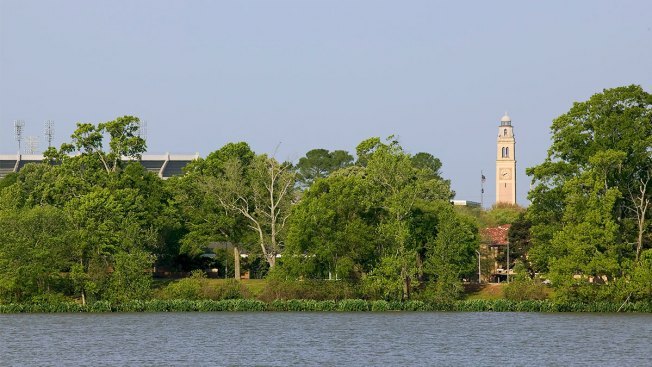 General view of the lake and Memorial Tower on the campus of Louisiana State University, in Baton Rogue, Louisiana. Louisiana State University announced the arrests Thursday of nine fraternity members for hazing-related crimes that included ordering pledges to lie in piles of broken glass, kicking pledges with steel-toed boots and urinating on them. The men arrested, ranging from ages 19 to 23, were members of Delta Kappa Epsilon. Their charges range from misdemeanor hazing to felony second-degree battery and false imprisonment, as the university toughens its approach to such incidents after the death of a pledge in a fraternity drinking ritual more than a year ago. DKE's national organization closed LSU's century-old chapter last month, saying members violated the organization's alcohol and hazing policies. LSU said the hazing allegedly happened last fall. "This type of behavior is unacceptable and at complete odds with what we expect from our students. It does not belong at LSU," university spokesman Jason Droddy said in a statement. Fraternity members poured gasoline on pledges, forced them to submerge themselves in an ice machine wearing nothing but their underwear, attempted to burn them with cigarettes and beat them with a metal pipe, according to arrest warrants. Police said interviews with victims revealed "many incidents of hazing took place throughout the fall 2018 semester." One victim "stated that after he was taken out of the ice machine, he was made to lay in the nearby basketball court. He stated that the basketball court had broken glass all over it, which he was made to lie on top of," the documents say, according to The Advocate. "The victim stated that another pledge was made to lie on the court next to him, face down while they were both sprayed with a hose, had milk crates thrown at them and were urinated on." Another victim said members of the fraternity "attempted to burn him with cigarettes and seemed to be attempting to extinguish their cigarettes on him. The victim stated that he fled the area in order to not get burned," one report says, according to the newspaper. Police wrote that Cade Duckworth, 23, of Lafayette, "seemed to be controlling the situation." Duckworth was booked on three misdemeanor counts of criminal hazing and felony counts of attempted second-degree battery, second-degree battery and false imprisonment. Among the other allegations, Duckworth's arrest report described making pledges hold a milk crate filled with ice and cayenne pepper above their heads while standing in a cold shower and looking up, which caused the ice to melt and the pepper to drip into their eyes. The ritual, police wrote, was called a "new boy shower." In the arrest warrant for Malcolm McNiece, 23, of Baton Rouge, officials said McNiece forced pledges to do push-ups while reciting information about the fraternity, and kicked them in the chest with steel-toe boots if they got details incorrect. McNiece was booked on four misdemeanor counts of criminal hazing and one felony count of second-degree battery. It wasn't immediately clear Thursday if the men had lawyers representing them. "This is a sad day for the university, but one that illustrates the cultural shift occurring at LSU," Droddy said. "The quick action by the national DKE organization by revoking the chapter's charter and the cooperation of several witnesses in this investigation demonstrate a growing recognition that hazing and other harmful activities cannot be tolerated." The arrests come as LSU cracks down on fraternity and sorority activities following the September 2017 death of 18-year-old freshman Maxwell Gruver, of Georgia, who died in what authorities describe as a hazing-related drinking ritual in another fraternity, Phi Delta Theta. Gruver's blood alcohol content was six times higher than the legal limit for driving. Louisiana lawmakers toughened the state's laws against hazing last year at the urging of Gruver's parents.